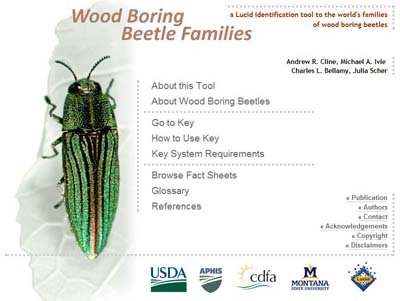 If you need to identify which wood boring beetle family you're dealing with, use the Wood Boring Beetle Families tool. The WBB Families tool delimits family-level taxa (both adults and larvae) of Coleoptera known to be wood borers. Wood Boring Beetle Families - a Lucid identification tool to the world's families of wood boring beetles.